Table of contents : Content: Part one: Concepts and contexts. Conceptualising and practising the systematisation of care. Systematisation and health policy. Using a systems perspective to improve healthcare processes. Empowering nursing and patient centred healthcare through the systematisation of clinical work. Using data to inform systematised approaches to care delivery. Part two: Experiences. Searching for systematisation - and its impact. Pathways in general surgery. A multidisciplinary process approach to cardiac services. Systematising the care of long term conditions: the year of care model. A year of care pathway for COPD: problems, pitfalls and solutions from practice. Making primary care systematic: successful cardiac care. Assessing the content and quality of pathways. The organisational elements of systematisation: the Otago experience. 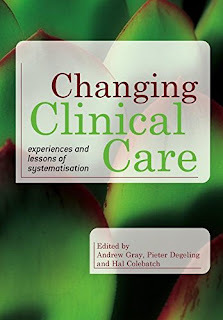 The place of the executive in the systematisation of clinical work: the experience of the Royal National. Hospital for Rheumatic Diseases. Networks and communities of practice: systematising collaboration. Part three: Implications. Changing clinical care and workforce development. Systematisation of clinical care and health capital planning. Systematisation and structures of authority. Systematisation in theory and practice.